^ 2.0 2.1 Owing to its rapid rotation, Altair's radius is larger at its equator than at its poles; it is also cooler at the equator than at the poles. ^ 1.00 1.01 1.02 1.03 1.04 1.05 1.06 1.07 1.08 1.09 1.10 NAME ALTAIR -- Variable Star of delta Sct type, database entry, SIMBAD. Accessed on line November 25, 2008. ^ 2.0 2.1 2.2 2.3 HR 7557, database entry, The Bright Star Catalogue, 5th Revised Ed.（Preliminary Version）, D. Hoffleit and W. H. Warren, Jr., CDS ID V/50. Accessed on line November 25, 2008. ^ 3.0 3.1 3.2 3.3 3.4 Imaging the Surface of Altair, J. Monnier et al., Science 317, #5836（July 20, 2007）, pp. 342–345, doi:10.1126/science.1143205, Bibcode: 2007Sci...317..342M, Template:PubMed. Accessed on line November 25, 2008. See second column of Table 1 for stellar parameters. ^ 4.0 4.1 Resolving the Effects of Rotation in Altair with Long-Baseline Interferometry, D. M. Peterson et al., The Astrophysical Journal 636, #2 (January 2006), pp. 1087–1097, doi:10.1086/497981, Bibcode: 2006ApJ...636.1087P; see Table 2 for stellar parameters. 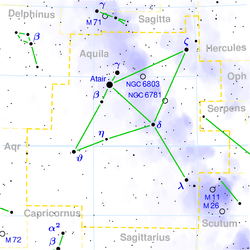 ^ Entry 19508+0852, The Washington Double Star Catalog, United States Naval Observatory. Accessed on line November 25, 2008.